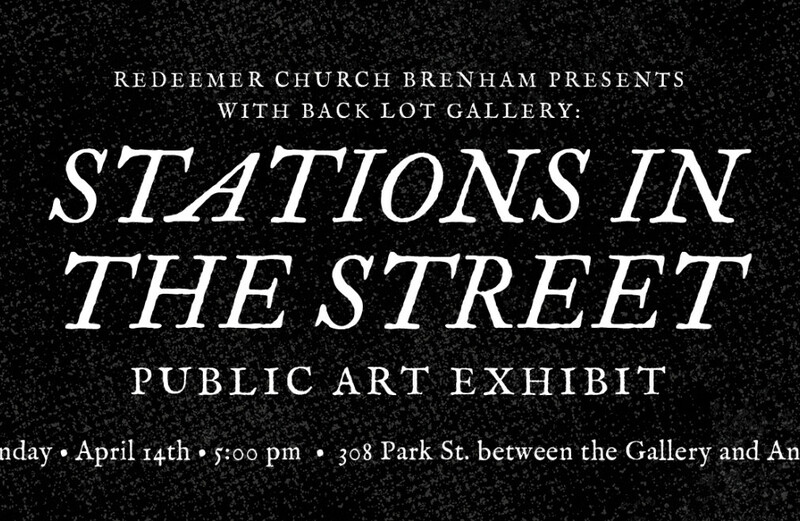 Redeemer Church Brenham, in conjunction with Back Lot Gallery, is excited to present “Stations in the Street” a public art display of the Stations of the Cross exhibit created by artist Scott Erickson. The Stations of the Cross began as a remembrance that pilgrims had when they were retracing Jesus’ final steps in Jerusalem up to the hill where he was crucified. We would like to share that practice and experience with our community. Please join us on Palm Sunday, April 14th at 5PM, as we gather to view the artwork, which will be displayed on the exterior wall of Back Lot Gallery, 308 Park St. (between the Gallery and Ant St. Inn). Food and drinks will be available for purchase nearby at Home Sweet Farm and JAX food truck if desired. The artwork will continue to be available for public viewing and meditation throughout this Easter season.